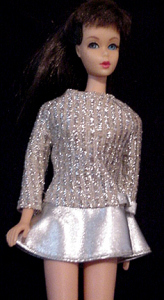 The Silver Lame Mini Dress has Long Sleeves, a Ribbed Silver Lame Bodice and a Metallic Silver Knit A-Line Skirt with a same fabric Bow at Waist. 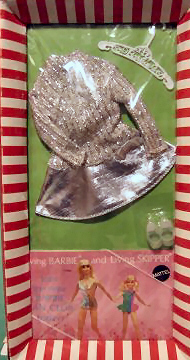 This ensemble was released both as a regular set (Silver Sparkle) and as an introductory promo set for Barbie Talk Magazine (Salute to Silver). Salute to Silver came in a special box that included the first issue of the magazine. The dress is fairly easy to find, though the bow is often missing and the stretch silver lame bodice is prone to stretch out of shape. The shoes are very hard to find.